Here are just some of the frequently asked questions we receive from our guests. Click on any question to go right to the answer! If you have any questions that aren’t listed here please feel free to give us a call toll free at 866.912.2233. Can you coordinate the china, glassware, linen rentals for our event? Do you offer a tasting? How much advance notice do you need for a full service event? Will the event planner I meet with and plan the wedding with be at my event? Do you offer bar tending services? Do I need to submit a security deposit to guarantee my date? When must I have my final guest count confirmed? We provide catering throughout Whatcom and Skagit County in Washington State. However, we’ve also catered events as far south as Puyallup. Please call to inquire for information regarding catering orders for Snohomish County and beyond. What events don’t we cater? We provide catering for weddings, corporate events, surprise birthdays, Bat Mitzvahs, meetings, memorials, social gatherings and celebrations of all types and sizes. Market Street Catering has been in business since 2000, has catered over 45,000 events, and served over 1.5 million people with complete guest satisfaction. Between our Executive Chef Bryan Weener, Executive Sous Chef Llodia Guerra, and many of our fabulous Full Service and On-the-Go Catering Event Planners we have amassed over 60 years of experience in the restaurant and catering industry. For the majority of our events we prep and cook everything at our Sehome Village Haggen NW Fresh store. For our full service events we love to always cook on site at the event location. 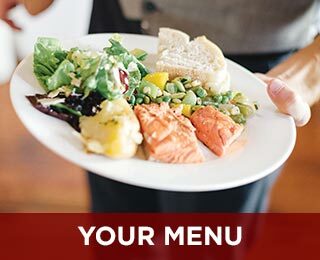 On-the-Go Catering (or OTG) is our service where we create premium foods and beverages that are available to be delivered or picked up at your Haggen store in Whatcom and Skagit County. 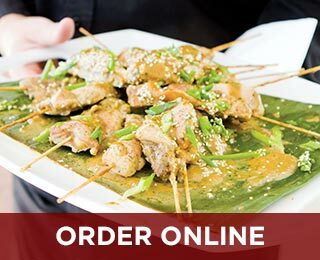 Due to the nature of keeping hot food hot, any orders with hot foods must be delivered, or can only be picked up from the Sehome Village Haggen NW Fresh store. Orders are made from scratch. To ensure your food meets the highest standards and that our full selection is available our chef’s request 48- 72 hours notice for food orders. *On a rare occasion, we can close certain dates for new orders, as the kitchen will reach full capacity for staffing and production. Please inquire for more information. There is no order minimum whether you are planning for 10 or 5,000 we’ve got you covered. However there are some items that have a minimum such as our little bites, and our a la carte menu and meal packages. These items are identified on our menus. We offer temp-controlled delivery service 7 days a week, 364 days a year (Haggen closes on Christmas Day). Orders can be picked up at any Haggen store of your choice in Whatcom and Skagit County free of charge. If you are wanting a pick-up at a Haggen location in Snohomish County or further south, please inquire as their is a minimum order amount and a delivery charge to Haggen stores. Delivery to your location, fees begin at $20.00. Please inquire for a more specific price for your delivery location. Full service catering is pretty much anything YOU want it to be. 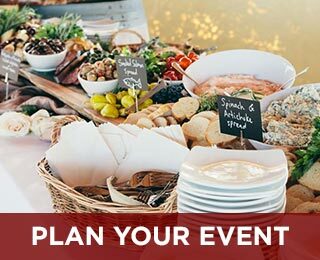 Full serviced events can include service staff, on-site cooking, rentals, linens, decor, unique menu items, set up, clean up, entertainment, and more! Yes. We can coordinate all of the rental items needed to execute your event. We use third party vendors for all our rental needs, please inquire for more information on our preferred vendors. Yes. Tastings are based on availability, your proposed menu, and must be arranged at least 2 weeks in advance. Tastings are complimentary for (4) items for a total of 4 people. If you do wish to add additional items, we offer up to (8) items MAXIMUM for a $10 charge per person at the tasting. Since are tastings can be labor intensive and expensive, we recommend choosing items that envision at your event and those that you need additional confirmation on. Yes. During our peak wedding season, from June through September, we can cater up to (3) Full Service events on one day. Please contact our catering office for more information on those dates and any other dates that you might be interested in that do not have a minimum. We can cater up to 3 events depending on its size on any given day, as such we take on business at a first come first served basis. Until a deposit is received your event is not guaranteed. Will the person I meet and plan the wedding with be at my event? Our event planners will most likely NOT be at your event. We have highly trained service professionals that excel at exceeding our guests expectations. Our team meets weekly to ensure that all the specific details of your event have been communicated. Occasionally our event planners will make an appearance. There is a standard industry service charge of 18% of the subtotal that is applied to your full service proposal and contract. This charge covers gratuity for the staff, fuel for transportation, laundry expenses, and other miscellaneous costs. Do you offer bartending services? What is a “Banquet Permit” and why is it required? Yes. Our bartenders are typically reserved for full service events, but may also be available for other events only requiring bartending. All bartenders are certified through the State of Washington’s Mandatory Alcohol Service Training (MAST). While your venue may not require you to obtain a Banquet Permit, Haggen Market Street Catering requires a Banquet Permit be acquired when bartending is contracted. This is something that is to be purchased by the guest and is $11. Please follow to the link to apply and for any information you may need. Every catering order and event must be paid in full in advance. We accept cash, check or all major credit cards including AMEX. Full payment is required when placing your On-The-Go Catering order. Catering does not accept EBT. For Full Service events and wedding cakes a signed contract and a 50% or $1,000 deposit, will guarantee your event date. For Full Service events the final guest count is confirmed 3 weeks prior to your event. Final payment is also due at this time. We will not be able to reduce the guest count or quantities of items after this point, but increases are still possible. For OTG orders changes or cancellation with less then 48 hours notice may result in full charges. For Full Service if your event is cancelled 60 days or more before your scheduled event your deposit will be refunded in full. If you must cancel between 60 and 30 days of your scheduled event your deposit will be refunded 50%. For cancellations due to snow please see our inclement weather policy here. Tipping is not necessary or expected for OTG order or deliveries. Gratuities for Full Service staff are included on your proposals and contracts labeled as service charges. No cash tips are expected.